You are currently viewing all posts tagged with camp. Assuming that the traffic would be poor and the ferry to the peninsula jammed because of the holiday, I awoke early and hit the road as the sun came up. As it turned out, there was almost no traffic and I only had a 5 or 10 minute wait for the ferry. 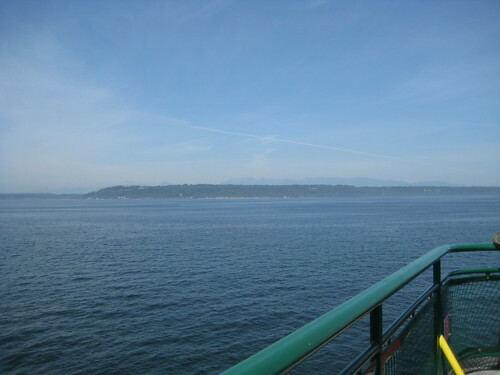 The ferry ride from Edmonds to Kingston on the Puyallup is a short, 25 minute cruise. I entertained myself by taking pictures from the bow as the mountains appeared. From Kingston, it was another short journey to Quilcene, where I left the highway for the forest. 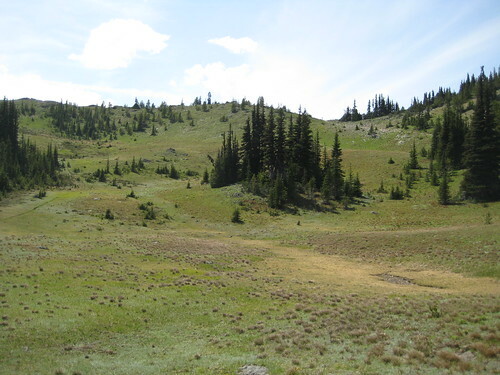 At the trailhead, I loaded up my gear, glanced over the notices, and signed in at the register, entering the Buckhorn Wilderness at about 12:30 PM. 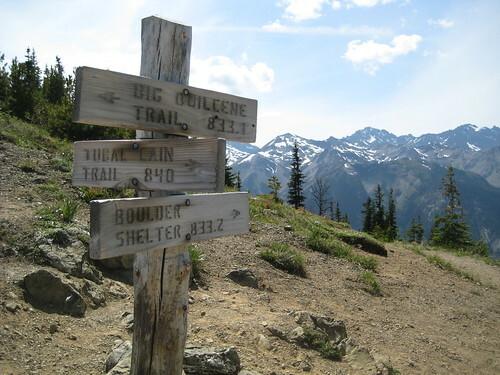 The hike to the pass is short and fairly leisurely, being only 5 miles and gaining 3,600 feet. It is an easy day hike and, it being a holiday, I was worried about the area being too crowded for my taste. Things were looking up on the way in, as the only people I saw were day hikers walking out. The trail follows the Quilcene River for the first few miles, wandering through a dense forest of Doug Fir, Cedar, and Hemlock. 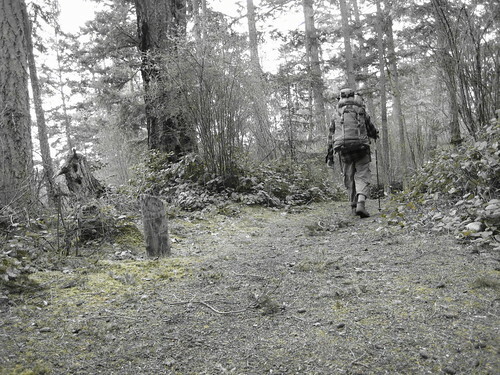 Halfway in, the trail passes through a cleared area that must be Shelter Rock Camp. It is empty, which is a good sign, but not surprising. 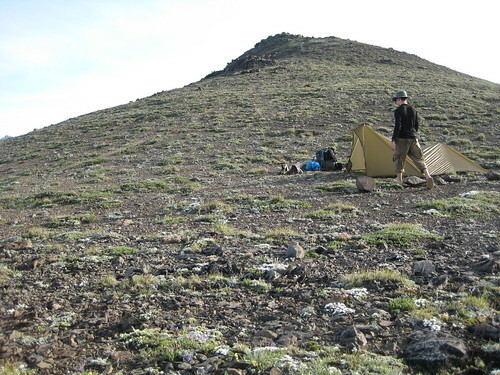 I cannot think why anyone would want to camp so close to the trailhead. Beyond Shelter Rock, the trail begins to climb. The forest clears for a spell, exposing the first views of the peaks of the Olympics. I pass a couple of day hikers going in, picking their way along slowly despite not having any weight on their backs. After them, I come upon a group of 4 backpackers plodding along the trail. Judging by the size of their packs, they must have a month’s worth of provisions. As I pass them, the trail turns a corner. 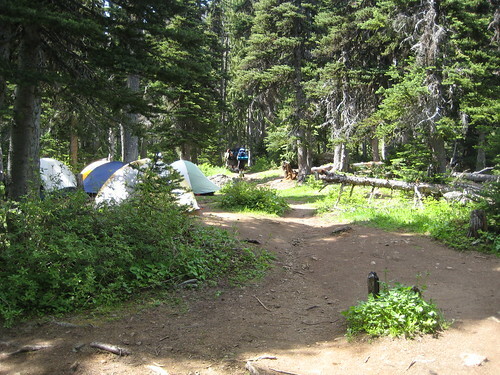 I am greeted by the second and last established camp on the trail, Camp Mystery. My heart sinks. It is the most depressing sight I could think of: a veritable village here in the wilderness. Over a dozen tents and more people crammed together, crowding both sides of the trail. I look to the trees and a cringe of embarrassment for these people runs through me. Everywhere, branches are laden with stuff sacks. Bear bags, they must be, but not one is hung more than six feet from the ground. Most are closer to 5 feet, hung near the trunks, where strong branches meet the tree. I cannot spot one that is further than a few feet from a tent. Either this is some weird cult, seeking to sacrifice themselves to the bears of the wilderness, or these people have no business being out in such an area. Either way, I was clearly dealing with mad men. I want to get as far upwind and upstream from these people as I can. I continue the climb to the pass, only another mile away. My bewilderment grows. I toy with the thought of going back down to the camp and screaming at the campers below; perhaps letting lose a well aimed rock or two. Anything to knock them out of their bout of insanity. What is it that inspires such emotion? The trees thinned. Meadows of grass and wild flowers replaced them. 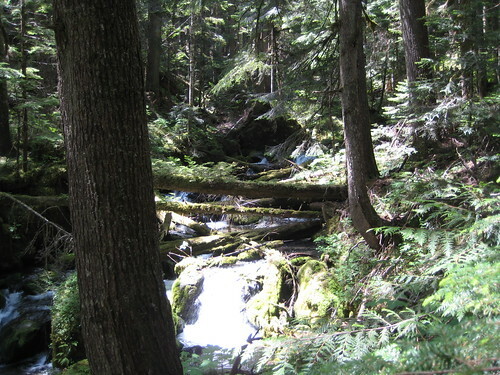 The Quilcene, which even a half mile back at the camp was a torrent, disperses into numerous little streams, here and there disappearing into the ground. Behind me, to the east, the view betrays the distant peaks of the Cascades, still topped with snow. 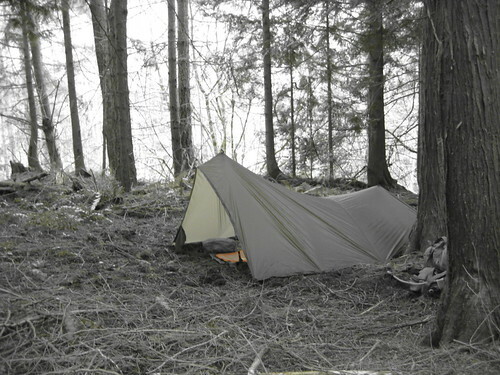 I could not, can not, and never will understand how anyone could stand to spend the night in such a crowded cluster of tents, closed in among the trees, with the river running noisily beside them, when not half a mile from them lies an Eden such as this. I continue the last leg of the climb to the pass, reasoning that if the forest, the mountains, the Earth itself can not talk any sense into the lunatics, I stand no chance of it myself. Reaching the pass, which sits at 6,000 feet, I find myself in a panorama. 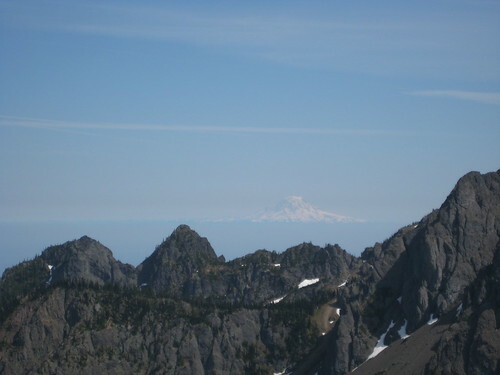 The view of the far off Cascades in the east is magnified. 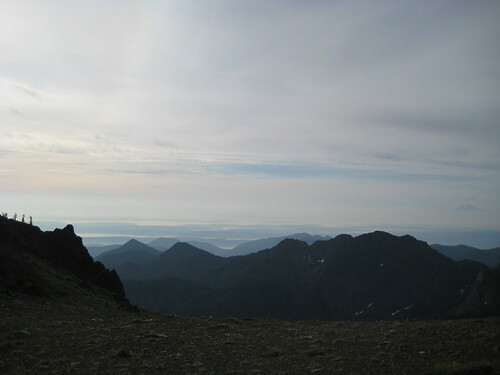 Looking West, I find myself level with the peaks of the Olympics. 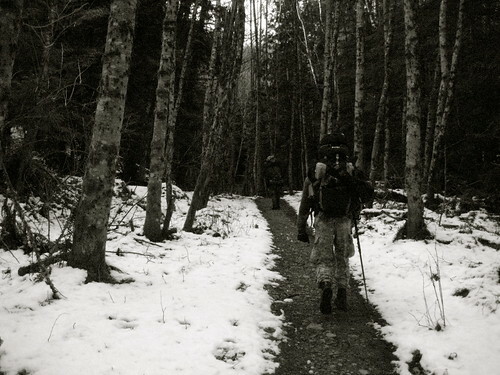 North and south: a trail along ridges, mountains without end. Northeast of me sits Buckhorn Mountain, whose summit is at 6,988 feet. A trail runs up from the western side. This is what E&Es and XTLs are made for, but the thought only briefly crosses my mind. It is only 3:30 PM and the trail up does not look too steep. I decide to climb to the top with my full pack on. Halfway up, I turn and look east again. Where before I had only seen a few small peaks of the Cascades, far off in the distance, Mt. Rainier now stands, dominating the landscape with its huge body and sky-scraping summit. A short distance further and the trail levels out. I find myself walking along the spine of the mountain, covered here with rocks and there with more meadows of flowers and grass. There is one tent with two people right off the trail. I congratulate them on their choice of bedroom. I go further, to the top of the summit, glad to have left the insanity a thousand feet below me. From up here, I can see the Hood Canal, the Puget Sound, San Juan Islands, Seattle, Everett, Rainier and Glacier Peak. I am in a world of mountains. Miles and miles I can see in everywhere direction, yet, wherever I look, the horizon is dominated by rocky peaks. Yes, I think to myself, this will be my home for the night. Sitting here, I am reminded of other journeys. This place and this view brings into strict contrast, particularly, California. Down there they have seen fit to trade all good clean air for smog and pollution. Looking west from the peaks of the Sierra Nevada it is not possible to see even into the foothills, much less the neighboring coast range. It is a lamentable development, to have had to sacrifice Oregon as a buffer state between us and them, but I hope it will give us the time needed to protect and preserve our own realm. Back here, on top of the mountain, I feel dehydration setting in – a tingling in my fingers. The day has been hot, the climb long. It is cooler up here, but also that much closer to the Sun. I had drunk the last of my 2 liters of water near Camp Mystery. I need something to drink now and more still if I plan to spend the night up here. But there is no water on the back of the mountain. So, I begin the climb down again. In an hour, I reach the meadows just above Camp Mystery and find a spot where a low but fast moving spring gurgles out of the Earth. There is probably no need to filter it, but I do. I sit for a while, slowly sipping a liter of water. Then I top off my bladder and bottle, giving me about 3 liters for the night. Tossing on the (now much heavier) pack, I turn around, and climb back up to the pass, then back up the mountain, reaching the summit again in another hour and a half. Now, at the top, I survey the area for a spot to pitch my tarp. I spot a small saddle back along the spine of the mountain, just below the main summit and out of sight from the other camp. The ground looks rocky, but that’s why I brought a sleeping pad. 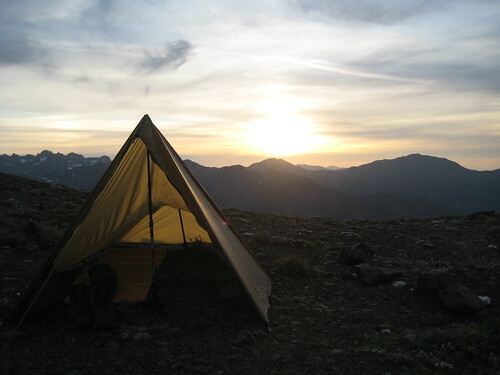 I clear away a few of the larger rocks and pitched the tarp there, opening facing east, as I always do, to catch the first warming rays of dawn. That done, I wander around a bit, exploring the area. I am particularly interested to find an outcropping of boulders with many loose rocks. 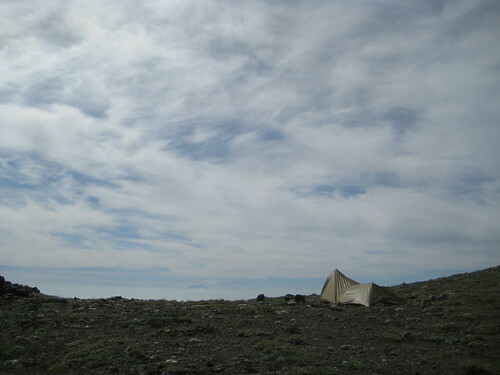 Originally, I had intended to spend the night at or just below the pass, which is situated at just about the tree line. As such, I had brought my bear bag hanging system to store food. Up here it is alpine. There are no trees available. In this outcrop of rocks, I can at least bury my bag. Of course, any rock that I can move, a bear can move with much more ease, but it is the best that I can do. All my food is individually packaged in ziploc bags, all of which are in an odor proof Opsak, which is itself in a stuff sack. It seems pretty scent-proof. As long as I cook and eat all my food in another spot away from camp, I see no reason why any bear would venture up this high to disturb me – particularly not with the buffet awaiting him down at Camp Mystery. As well, I am on National Forest land, not National Park. One of the benefits of National Forests is that dogs are allowed. The other camp further back along the spine of the mountain has a dog with them. Coming up the mountain from that direction is the most likely route for anyone, bear or human. The dog would be an excellent sentry, warning me of any intruders. I cook my dinner and stash my food. It was about 9:00 PM now and I was just thinking that this place would be worthy of an annual pilgrimage, whether fireworks were visible or not, when I caught sight of some motion to my left. 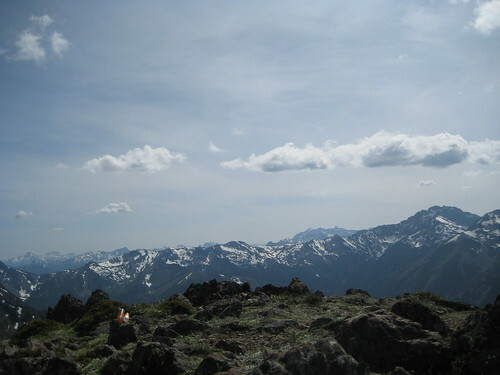 I turn, looking towards the steep southern slope of the mountain and saw something white. I am stunned for a moment. I am used to the browns of deer, elk, and cougars and the black of bears (no Grizzly out here), but white? Recovering, I realize what it is. 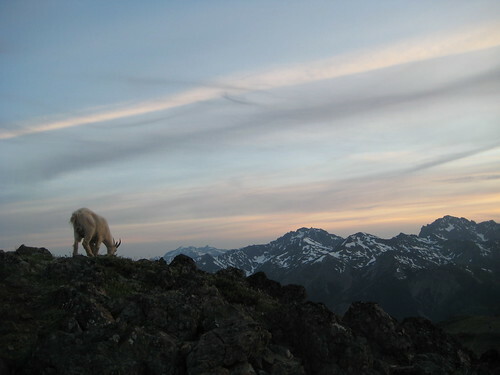 A Mountain Goat. For myself, the very spirit of the mountains. But so rare to see. 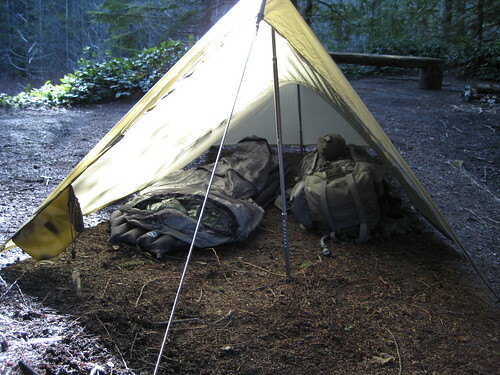 I rush back to my tarp, bend down, with my back to where he had appeared, and grab the camera out of my pack. Turning around, I half expect him to have vanished. But he had not. He was only a few feet from my tarp, and approaching. Out of myth, out of time, the great god Pan walks towards me. In shock of his lack of fear, I can only stand, pointing my lens towards him. For a moment or for an eternity, I am set loose from the fetters of the profanity below. The human world is shattered by his presence. He looks at me, and I find myself at once in another place. Older, wider, and deeper. There is no other sound here, above all things, and he is close enough for me to hear his breath. He leads on, and I follow. I try not to make much noise, but he, casting an eye at me over his shoulder now and again, is aware of my presence. We walk in the light of the setting sun for a time. At the top of a small rise beyond my camp, I stop, and allow him to continue alone. The sun has set now, leaving the western sky a blood red. But rising in the east is a full moon. It will not be dark tonight. Reaching my tarp once again, I can see the lights of the cities far away – isolated attempts to drive back the night and the cycles of the world. It is near 10:00 PM now. The fireworks begin. Tiny explosion of red and white along the coast in an endless stream from Everett to Seattle. Soundless flashes of light. I wonder what a war would look like from up here. It is night now. 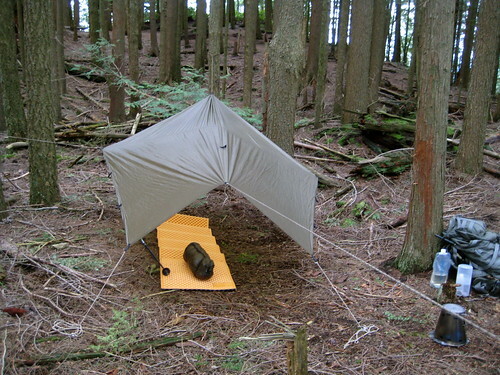 I crawl under the tarp, into my sleeping bag. Lying on my stomach, looking out from under my shelter, I can still see all the explosions. They are not as impressive as the rest of this world. I quickly lose interest and turn onto my back to go to sleep. Perhaps half an hour later, I hear movement out to the south. Pan walks by, three or four feet in front of my bed. His gait is quicker now, eager to return to his own bed after completing his business. In the morning, I am awakened by the sun. Clouds are in the sky. There is a wind blowing across the mountain. I go to where I buried my food and, finding it unmolested, return with it to camp. Having nothing particular to do this day, I walk around the mountain some. 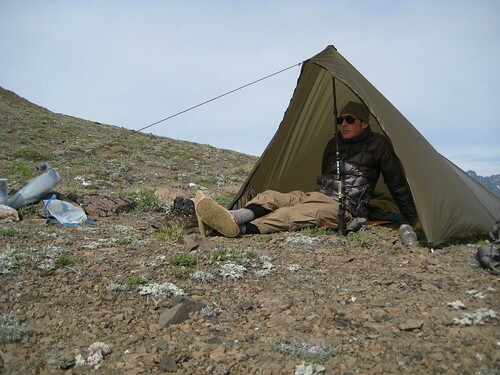 I do some sitting, then return to my tarp to continue sitting out of the wind. For a while, I lay, listening to the bees dance with the few flowers outside. Eventually, it is time for breakfast. I finish eating at 11:30 AM and decide to break camp. At noon I am packed and head back down the mountain, through the pass, and into the valley. Back at the trailhead at a bit past 3:00 PM. This post was published on 2009-07-06 . It was modified on 2012-09-15 . It was tagged with camp, wilderness. This past weekend I took a walk out to the Chuckanuts, visiting the same spot Avagdu, HatterOfMaddnesz, and I visited a couple months prior. The ice had disappeared from the lake by now. I opted to pitch my tarp up at the viewpoint above the lake, which had caught my fancy last time around. The sun was out and not a drop of rain fell from the sky for both days, making for a pleasant contrast with the last few trips I’ve taken. In the evening I could watch the sun set over the San Juan islands in the west, and the following morning watch the sun rise over Mt. Baker to the east. I set my Kifaru Paratarp up in an elevated manner, opting to rig it to trees with paracord rather than using my trekking poles underneath. This makes for a huge amount of living space underneath. On the way out, I made a detour to Raptor Ridge, another nearby viewpoint that I had been unable to visit on the outing with Avagdu and Hatterz. After fixing a small breakfast and soaking in the view, I finished the 12-ish mile hike home, munching on the odd Stinging Nettle leaf plucked from the side of the trail and pondering butterflies. This post was published on 2009-04-20 . It was modified on 2012-09-15 . It was tagged with camp, gear. This post was published on 2009-03-30 . It was modified on 2012-09-15 . It was tagged with quote, camp, the road. Avagdu and HatterOfMaddnesz claimed that this was the longest hike that they had done in a while, but they both pulled through. Avagdu used the opportunity to field-test his INCH Bag, which was quite heavy. It gave him a hard time. I think he’ll be shedding some of the redundancy the next time around. Certainly, we all learned something. We spent two nights at a lake and took a hike up to a ridge that gave views of Mt. Baker to the east and the San Juan Islands to the west. (I took a nap.) My camera battery died soon after setting up camp the first night, so pictures are sparse. This post was published on 2009-02-19 . It was modified on 2012-09-15 . It was tagged with rantmedia, camp.